The pH of distilled water is theoretically about 7. In practice, it’s difficult to put an exact number on the pH of distilled water because simple exposure to air can dissolve carbon dioxide. Why does the pH of a substance matter? What is distilled water? Let’s put the pH value of distilled water into context by discussing what distilled water is and why the pH of a substance is important to be aware of. Distilled water is water which has been boiled and collected in a container after boiling. When the water is boiled it turns into steam and this steam is condensed into liquid when it is collected in a separate container. One of the primary reasons to distill water is that the impurities found within water separate out and are left in the original container during boiling, making distilling water a useful way of purifying water. Distilled water is often used for a variety of industrial applications as well as in laboratories. Biological and chemical labs often use distilled water when experimenters want to be more certain that impurities within the water did not taint the results of their experiment. 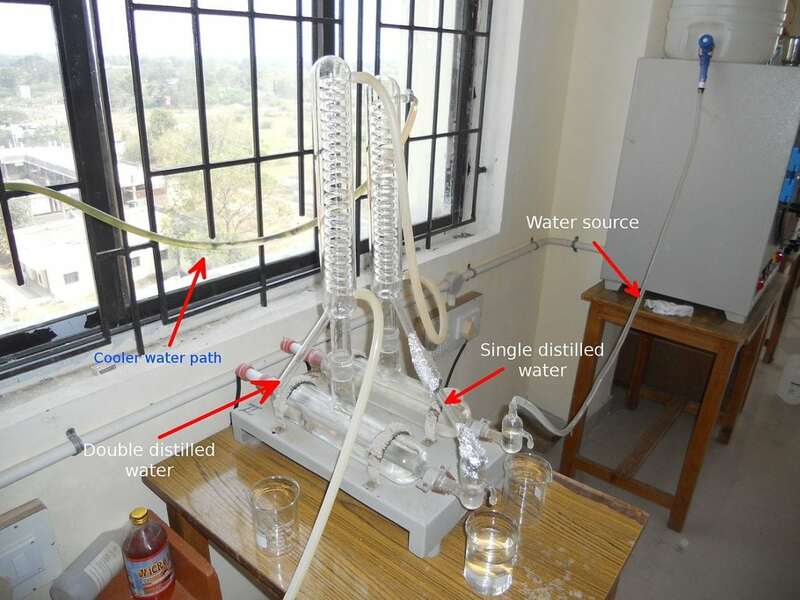 When extremely pure water is needed for an experiment, water that has been double distilled may sometimes be used. Distilled water may be used in an aquarium to ensure there are no known or unknown contaminants within the water, at which point necessary minerals can be introduced into the aquarium. Another situation where distilled water may be preferable to use than regular water is in cooling systems for cars. Ions of minerals commonly found within tap water often prove damaging to lead-acid batteries, so distilled water is more likely to be used by cooling systems. The pH scale is a convenient method of comparing how relatively acidic or basic one solution is to another solution. 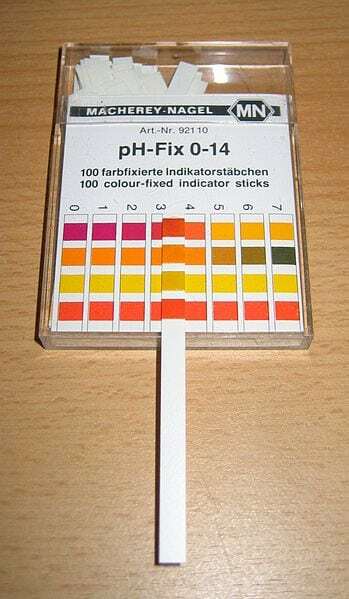 The pH scale typically runs from 0 up to 14. The pH scale is a negative logarithmic scale, meaning that for every integer that you move up on the pH scale, the concentration of H+ (hydrogen) changes by a factor of 10. Note that there’s an inverse relationship that exists between the pH and H+, so when the pH increases the concentration of H+ decreases. A neutral solution is set at the value of pH = 7, while solutions with pH values lower than seven are considered acidic. Solutions with pH values higher than 7 are considered basic. Likewise, since the pH scale is based around the concentration of H+ in a solution, the higher the concentration of H+ the more acidic the solution is. Here’s some examples of common solutions and their pH values: Milk has a pH of about 6.5, making it a weak acids. The yolk of eggs has a pH value of about 5.5, and so does regular rain, making them both weak acids, but slightly more acidic than milk. Coffee has a pH value of about 4.8, while at the far end of the acidic side of the pH scale is battery acid which has a value of approximately 1.0. On the other side of the scale is the base side. Blood has a pH of around 7.3, making it a weak base. While seawater has a pH of around 8.0, and baking soda has a pH of approximately 8.0. All of these substances are weak bases. A stronger base is milk of magnesia, which has a pH of around 10.6. Meanwhile, a very strong base is household lye which has a pH of approximately 13.5. Both acid and basic substances can be corrosive substances, which can cause tissue damage and harm people’s eyes, skin and mucous membranes. The pH of the the solution, the concentration of the solution, and the duration of exposure to the solution all affect how damaging the solution will be to one’s tissues. Acids that have a pH value smaller than 4 are capable of creating chemical burns. Some of these dangerous acids include phosphoric acid and sulfuric acid. Weaker acids like citric acid and acetic acid aren’t usually corrosive to the human body and can be safely consumed. Strong bases are those bases that have a pH value of 10 or greater, and these bases are also capable of causing chemical burns. These strong bases include sodium hydroxide, potassium hydroxide and calcium hydroxide. These chemical bases can also reach violently with water, including having exothermic reactions that give off heat. The pH value of distilled water is theoretically 7, neither an acid or base. If you tested distilled water immediately upon opening a container, that is probably what you would get. However, as soon as distilled water is exposed to air it begins dissolving carbon dioxide and starts shifting to become slightly acidic. After a couple hours exposed to air the pH value will likely be around 5.8. So know that we know both acidic substance and basic substances can potentially harm you, is it safe to drink distilled water? After all, the pH value of distilled water is right in the middle at 7, making it neither very basic or very acidic. There’s something of a controversy regarding whether or not it is safe to drink distilled water, and drinking distilled water has been both supported and discouraged. Distilled water necessarily lacks ions of things like calcium and minerals that the human body needs to maintain its basic biological functions and preserve homeostasis. However, most people get sufficient amounts of these things from their diets and lacking a little of the calcium traditionally found within potable water is unlikely to do major damage to their health. It is also possible that distilled water could be better for a person than tap water, especially if the tap water a person consumes is contaminated with harmful chemicals like pesticides. Ultimately, it comes down to an individual’s needs and health officials encourage people to research the mineral content of their drinking water, whether they drink bottled water or tap water. Talking to a doctor regarding decisions to change drinking water and ensure that one continues to get proper mineral intake is also advised. Previous Post« Previous Can You Microwave Styrofoam?